Since 1 April, we've all been tasked to take photos given the stipulated theme...and we've all done them relatively well; some better, some worse, some odd, some with animals, some with manipulation. Well, since Monday, mine have taken a sinister turn in a way...mine are all versions of the theme...but the theme as it plays out when you have a flu. Today's photo was no exception. First off, please go 'round to all the other participants of the non-contest and see what they've come up with as I'm sure you'll be inspired much more than if you only looked here. Their names and links are: MikeWJ, Nicky and Mike, Mo, Meleah, John, aka nonamedufus, Bryan, aka Unfinished Person, Malisa, Nora, LaughingMom, Tanya, Elizabeth A., 00dozo, Cheryl, Kristen, Katherine, and, last -- but definitely not least, Ziva. 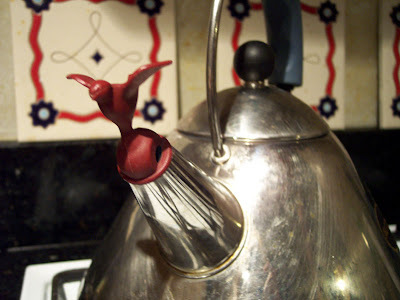 This is my Alessi tea kettle I've had for at least 25 years...it sports a little bird whistle made out out of moulded plastic or high-heat resin fibers or who knows what it is...but it whistles when the kettle boils. I've been using the tea kettle a lot lately as I'm sick. Truth be told, my son did not appreciate the angle and the staging of the kettle in my photographs and took a couple of his own. He was right. They were better. I never claimed to be artistic...he was always the artistic one. So, in a way, I believe he deserves credit here and all I deserve is the fact that I came up with the kettle/bird whistle idea. So, if I have to be moved down to the bottom of the pile...go ahead and do so -- as I already feel low enough with my sickness. I was going to "capture a whole other bird" - but my children told me it was too juvenile to do...so I didn't...but it did indeed capture how I felt about feeling sick, that's for sure. That's one beautiful tea kettle and your son did a great job with the staging. You may have a budding artist in your midst. Hope you feel somewhat better today. Yeah, he does. But he'd better watch out or that bird will peck it out. Because that's what birds do. They peck your eyes out, even the good ones. What a great kettle. Very unique. That is a fabulous kettle. I'm insanely jealous and craving a cuppa. Your son did a wonderful job on the photo and I like your idea for the theme. Hope that the tea makes you all better! This photo is disqualified because it wasn't taken by you. I won't even look at it. Also, that bird appears to be lunging forward to peck out your eyes. Because that's what birds do. They peck out your eyes. It should be disqualified. I was going to just say I didn't want to participate the whole rest of the contest. I'm having massive depression issues here and they aren't getting better. Sick of it all. Waiting for the bird to come and peck out my eyes already. I hope it also hits my carotid artery while it's at it. I think that's a LOVELY teapot! Kudos to your son. Don't listen to MWJ! Probably looks pretty cool while the water's boiling with steam pouring out of the spout. I love whistling kettles - mostly because that that they remind us to turn off the potential house burning hazards. Wait. I don't like tea. I like ice tea but not hot tea. But I do like your kettle. I would like to see the steam send that bird flying off into space! That would be cool, wouldn't it? 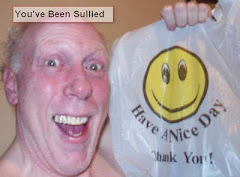 You sound depressed. Maybe you need to put a little sumpin' sumpin' in your tea. I suggest Crown Royal...not to be confused with Royal Crown. Nah - the bird can't go flying off - it has like a spring type mechanism inside it which holds it in place. You have to really yank that baby off to remove it. um... capturing a whole other bird would be very juvenile. Very juvenile, indeed. Hey, I wanted to do it - they are the ones who told me it was juvenile. Damn kids. I like this; it's innovative, interesting and fundamental. And I hope you feel better today! I like this photo! It looks like the little guy is about to take off.